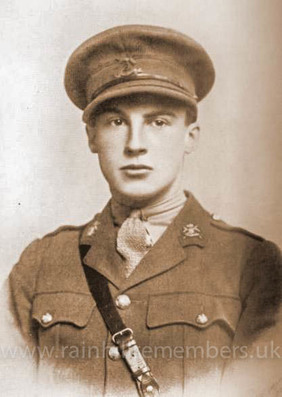 Born on August 2nd 1898 in Market Harborough, Leicestershire, Osmund Frederick Stapleton-Bretherton was the only son of Major Frederick Bartholomew and Bertha Mary Stapleton-Bretherton. He had two sisters, Ruth Mary Elizabeth and Mary Henrietta. From the age of 10, Osmund’s education appears to have been planned with the idea of a future career in the army, possibly in the hope that he would follow in his father’s footsteps and become a high-ranking officer in the army. He played cricket and football for the school and took part in the inter-house sports, gymnastics and Officer Training Corps. competitions. He was a House Prefect in 1914 and 1915 and he was a member of the Sacristy from 1910 – 1915. On leaving Downside in 1915, he went to Sandhurst for military training. He was gazetted to the 9th Lancers in July 1916 and received promotion in the following year. In May 1917, Osmund returned home on leave. 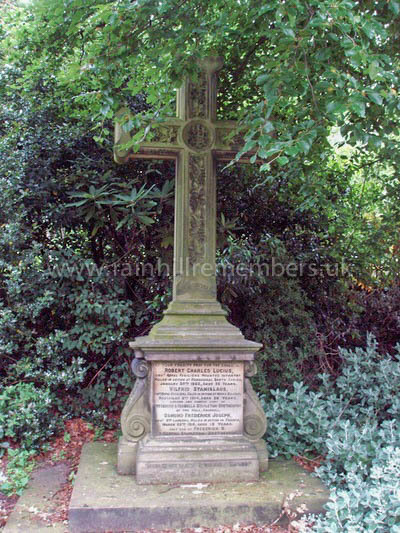 His father Major Frederick Bartholomew Stapleton-Bretherton was away fighting at the Front, and it fell to Osmund to give his sister, Ruth, away at her marriage to Major R.V.C. Bodley. After leave, Lieutenant Osmund Stapleton-Bretherton returned to fight on the Western Front. A letter from Osmund’s uncle, Rowland Feilding who had married Major Frederick’s sister, Edith Stapleton-Bretherton describes a chance meeting. …. I met a string of cavalry horses returning from water. I was admiring the boots of the subaltern who was walking in front and thinking what a glorious contrast they were to the ill-fitting slipshod things one sees in the trenches, when I glanced up at the officer’s yellow woollen waistcoat, and then at his face . Who do you think it was? – Osmund smiling all over, whom I had not seen since that day at Windsor when he came over from Sandhurst and who has now grown into a man I was taken off to have tea at his camp at Doingt ….. Afterwards I walked back here – about 4 miles and Osmund came part of the way with me. He is just the same delightful enthusiastic boy he always was. He had been doing an infantry spell in the trenches and had been on patrol, and was bubbling over with his experiences. He is one of the sort who sees only good in people, and all his geese are swans. Sixteen days later, Osmund was killed in action on March 22nd 1918 at the age of 19 years. Below is the telegram received by Osmund's mother Bertha informing her of her son's death. ​After the war, a Rainhill soldier Joseph Patrick Hennin told his daughters Gertrude & Frances “I met Osmund Bretherton by chance in France in 1918. We talked about home in Rainhill for a few minutes, then Osmund walked away into a wood and was never seen again”. He was laid to rest in a Commonwealth War Grave at Pozieres in France. The Pozieres Memorial relates to the period of crisis in March and April 1918 when the Allied Fifth Army was driven back by overwhelming numbers across the former Somme battlefields. 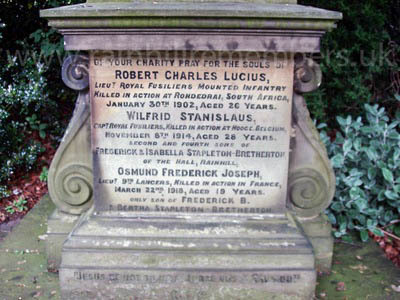 Osmund is remembered on the war memorial at Husbands Bosworth in Leicestershire and on the Bretherton family memorial in St Bartholomew’s Churchyard, Rainhill. At a special ceremony at the Warrington Road Cenotaph on Sunday 3rd July 2016, Rainhill village dedicated a new plaque bearing the names of 17 men with Rainhill connections who perished during WW1. These men's histories were found during Rainhill Civic Society's research. Rainhill Parish Council funded the plaque and organised the ceremony with Rainhill Civic Society, our local Churches and the Royal British Legion. Osmund Frederick Joseph Stapleton-Bretherton is one of those names.